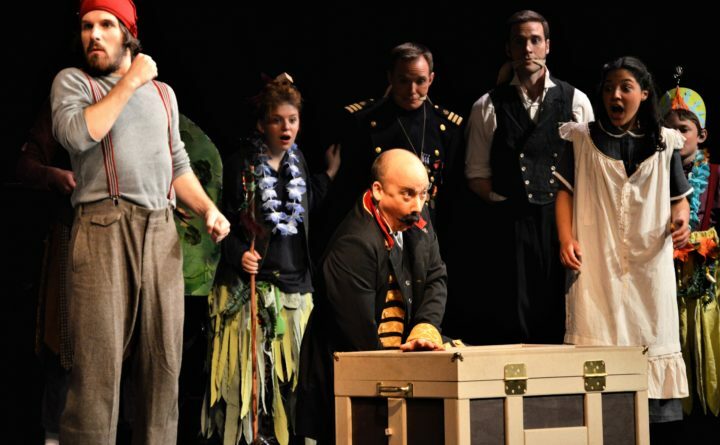 Tyler Johnstone (from left to right), Phoebe Norman, Bryan Hayes, Nathan Roach, Laila Al-Matrouk and Chris Hayes watch as Black Stache, played by Jason Bannister, slams his hand in a trunk in Midcoast Actors' Studio's production of "Peter and the Starcatcher." Ever wonder how Peter Pan got to be the boy who never grows up? Where Wendy got her spirit of adventure? Not quite sure that story about a crocodile snapping off Captain Hook’s hand rings true? 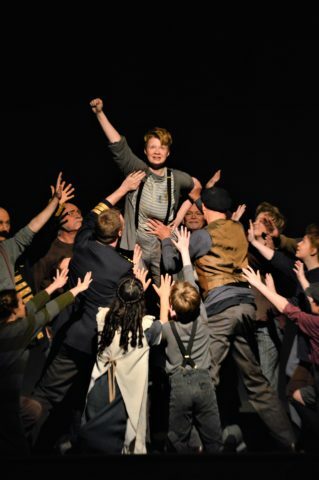 “Peter and the Starcatcher” is being performed through May 20 by the Midcoast Actors’ Studio in Belfast, and it answers all those questions and more. The play is a little Gilbert and Sullivan, with a hearty portion of Monty Python added, and a ton of tongue twisting dialogue thrown in for good measure. The multi-generational cast worked hard at Saturday’s matinee to overcome the play’s inherent flaws but was not quite able to breathe life into the dull first act. To match the frenetic pace of Act Two, the cast needed another week of rehearsal. Overall, the production is another example of how this company is edging its way to being Maine’s most professional community theater group. Peter, played by Grayson Koelbl, prepares to fly in the Midcoast Actors' Studio's production of "Peter and the Starcatcher." “Peter and the Starcatcher” is based on the 2004 novel by Dave Barry and Ridley Pearson. Rick Elice and Wayne Barker wrote the play that premiered in early 2009 at La Jolla Playhouse in San Diego. It ran on and off Broadway in 2011 and 2012. Director Meg Nickerson, a veteran of the midcoast theater scene, manages her talented cast well. She expertly utilizes the large Crosby School Center stage with minimal scenery and props that are easily and quickly moved on, off and around the stage. Previous productions have dragged due to slow set changes. “Peter and the Starcatcher” has a few songs but not enough for the show to really qualify as a musical like “Pirates of Penzance” or “Spamalot.” The best song in the show is “Mermaid Outta Me,” a ditty about sailors being turned into the mythical sea creatures by starstuff. It is hysterical, due in large part to the outrageous costumes by the trio of Elaine Bielenberg, Sarah Joy and Linda Marie. The scene stealer in this show is company founder Jason Bannister as Black Stache. He is delightfully wicked and wonderfully sinister as the pirate plots and plods through a sea of outcast orphans and men who are the very model of modern major Englishmen. With his sidekick Smee, played to slapstick perfection by Tyler Johnstone, Bannister lifts the production past the slow first act to a rollicking conclusion. These actors’ comic timing is impeccable and their energetic performances are infectious. Laila Al-Matrouk and Grayson Koelbl give charming performances as Molly and Peter, respectively. Both have an uncanny ability to foreshadow the characters of Wendy and the boy who refuses to grow up in J.M. Barrie’s “Peter Pan.” They each bring a quiet wisdom and sense of adventure to their characters, a skill some adult actors are never able to master. Other cast standouts include Jay Holland as Mrs. Bumbrake, who channels his inner Mrs. Doubtfire to bring out the nanny’s charms. Holland is equally matched by love interest Alf, played with panache by Peter Conant. Eric Sanders as Slank, the greedy captain of the Neverland, and Nathan Roach as Molly’s father and her majesty’s spy, Lord Leonard Aster, perform admirably. “Peter and the Starcatcher” is not as good a play as “Peter Pan” but the antics in the second act are well-worth the slog through the slow first one. With this production, Midcoast Actors’ Studio again has shown itself to be a community theater that stands head and shoulders above the average group performing in Maine. “Peter and the Starcatcher” will be performed through May 20 by the Midcoast Actors’ Studio at the Crosby Center, 96 Church St. in Belfast. For information, call 370-7592 or visit MidcoastActors.org.